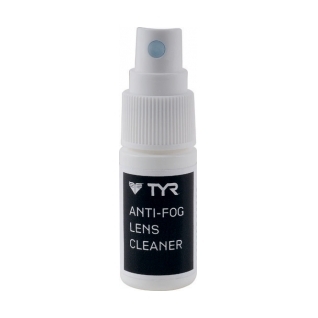 This Tyr Anti-Fog Spray is designed to keep lenses clean, clear and fog free. the LAF Anti-Fog Spray instantaneously cleans and coats your lens surface. This stuff works great at elongating the life of your goggles. I use it religiously after each workout immediately after. Just rinse your goggles with water and clean the inside with this cleaner and it will help keep out hard water buildup. I typically get over a year out of a pair of goggles instead of 3 months or so and I swim 4/5 days a week. It doesn't help much in terms of anti-fog, but the cleaner works great.